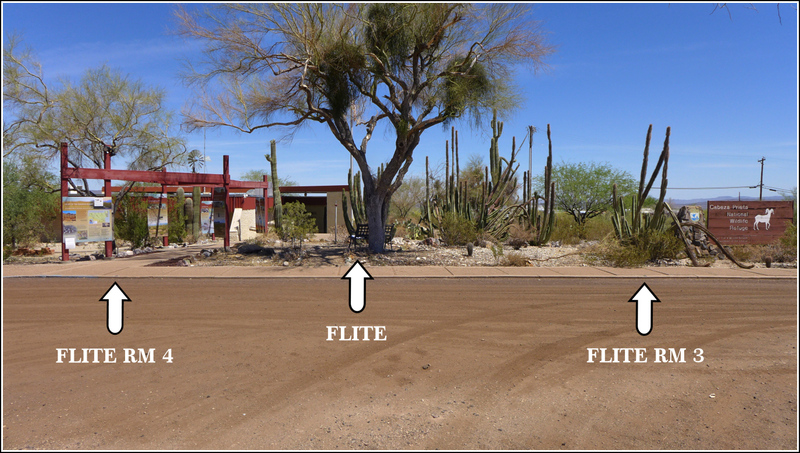 FLITE was the first mark I put on our list when we made our plans to travel to Ajo this spring. It's a tri-station, which is our favorite type of mark to search for, and it's located at the Cabeza Prieta visitors center, which we wanted to check out anyway. We stopped to search for the mark this morning on our way out of town, and we weren't disappointed! The two reference marks that still exist are easy to find, set into the curb of the sidewalk right in front of the center. The station was a bit more difficult for us to uncover (literally!). 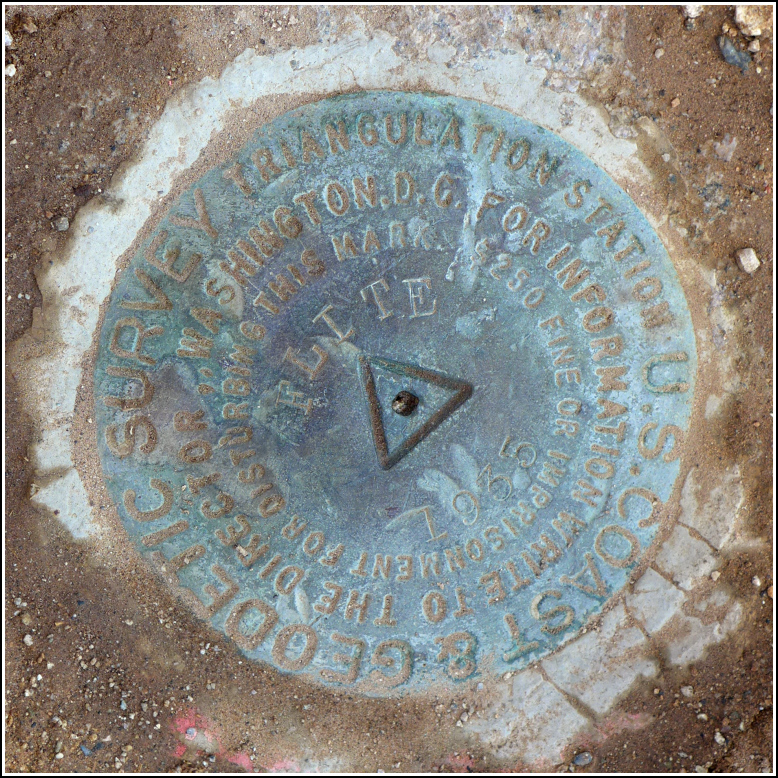 We couldn't spot anything near the coordinates, so we figured it must have become buried over the years. Without a good idea of where to dig, we were stuck, so we resorted to checking the Geocaching.com page for this station and using the photograph by "AZcachemeister" as our guide. 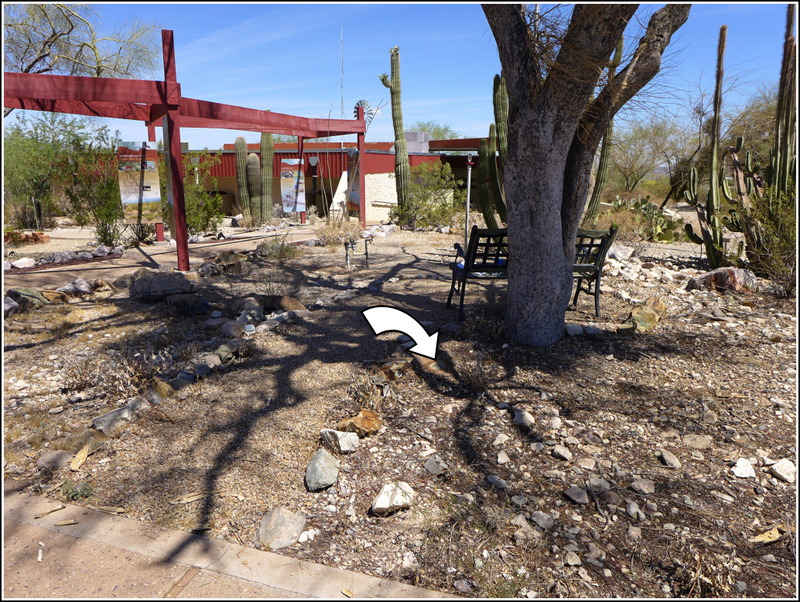 His photo, taken in 2007, clearly shows the location of the station in reference to the palo verde tree. We scraped off some dirt from the correct area, and Rich spotted the mark right away. He then went to work cleaning the mark with water and a paper towel while I documented the reference marks. After we were done, we placed a small rock on top of the station to protect it just a bit, but leave it easy enough for the next person to find. We were both curious about the vistors center, so we checked it out after finishing up with the tri-station. It was actually pretty impressive! We watched a video about the wildlife refuge and then walked the interpretive trails behind the center. We saw a leafy ocotillo (most that we saw in the wild had already lost their leaves) and a heart-shaped pad on a prickly pear. 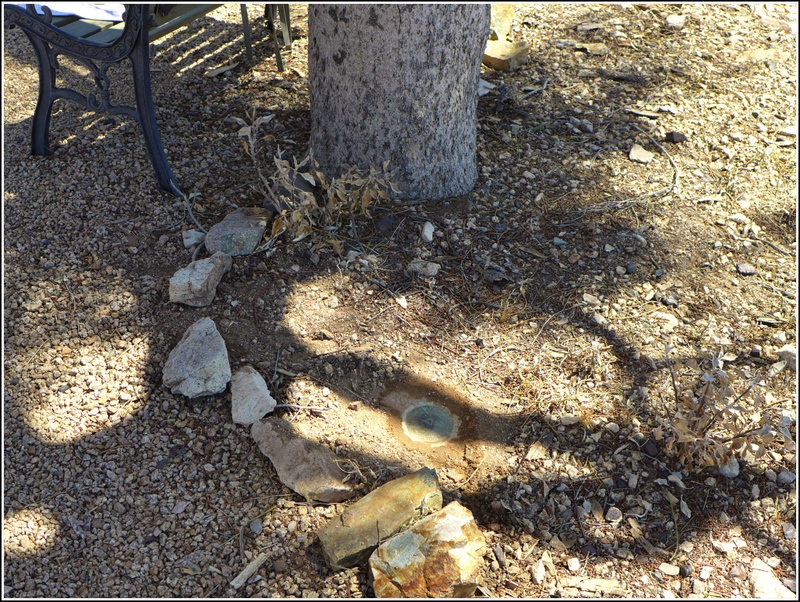 We couldn't find any desert pupfish in the pupfish pond. It was hot and sunny and the paths provided a perfect short walk for our morning. All three marks are in good condition and were found as described in the 1979 recovery. The station and reference marks 3 and 4 were recovered in good condition. All marks are as described in the 1979 recovery note. Relative positions of the three marks. Looking N from parking area.